Spanning cultures, spanning languages. Ladies and gentlemen...Bouchon le clown! As you can see, fear knows no national boundaries, especially when "ballons" are involved. I'm not sure about the ambiguous "Now 11 years" part. Does that refer to how long he's been out of prison? He can even walk on stilts! 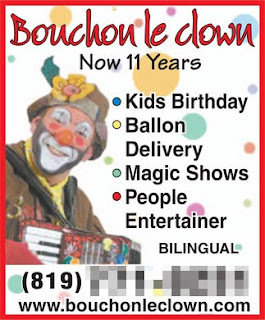 What gets me is the "ballon" [sic] delivery and the fact that he's a "people entertainer." What, are you going to hire him to do a birthday party for your cat?